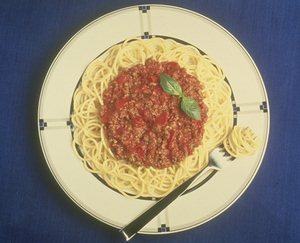 hen I ate a bowl of tomato pasta at Las 4 Linternas Restaurant in the Galápagos Islands, I helped destroy delicate ecosystems and devastate the animal population. Forever. So how does eating a bowl of pasta wreak so much havoc? It didn't even have meatballs. Well, imagine what it takes to get those noodles from 600 miles away on the coast of Ecuador ... to the Galápagos Islands ... onto the island of Santa Cruz ... into the city of Puerto Ayora ... over to Las 4 Linternas Restaruant ... and finally to my plate. Just take the tail end of the trip. The cook who made my dinner came to the islands from Ecuador's mainland because the jobs pay 75 percent better here than they do on the mainland. He came with his wife and four children. His children all need to go to school, which requires teachers, janitors and a principal. They also like ice cream on Sundays, which means they need dentists, too. The waiter who served my pasta, a good-looking Ecuadorian boy wearing Tommy Hilfiger pants and a tight T-shirt, didn't move from the mainland. He's a Galápagos native (Galapagueño). But, his taste for hip clothes helped fuel the demand for a new clothing store that opened on Main Street. There, you can buy all the latest fashions  at prices well above what most people can afford. My waiter can earn the money for his jeans by working longer hours. But his friend, a fellow Galapagueño who catches fish for a living, has to take more fish so he can pay for these fashions. 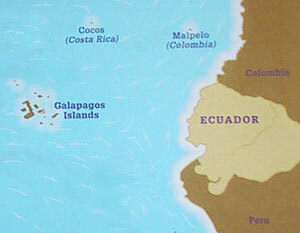 The waters around the Galápagos are already over-fished. You can always make more jeans. The fish will run out. The restaurant owner, an older lady with jet-black hair who peers at her clientele from behind bifocals, is earning good money by serving tourists like me. She's made enough money that she was just able to buy a new car, which was shipped in from the mainland. For decades, she was content to walk from place to place. Now, as many of her friends are getting cars, she is, too. Puerto Ayoro, which used to be a quiet seaside town, now roars with motors and bellowing horns. The smell of exhaust is starting to overpower the delicate fragrance of the flame trees that line the streets. The tomato, onions and garlic in my pasta all had to be imported from the mainland, too. Along with this produce came some of the 60 introduced species that entered the Galápagos this year. These species, mostly insects but also seeds and small reptiles, are slowly but surely beating out the species that have lived in the Galápagos for hundreds of thousands of years. Introduced blackberry plants are destroying rare native miconia plants. Mainland fire ants are infesting tortoise nests and killing the babies. No one even knows what the newly arrived frog will do to the ecosystem. I will pay for my pasta using Ecuadorian Sucres, which I bought with U.S. dollars at the bank. The bank employs 63 people, who, like everyone in the restaurant, hotel, taxi, shipping, grocery, clothing and service industries will need shelter, electricity, water, food and a place to dispose of their waste. All of this adds up. There are now 20,000 people living on this tiny, fragile archipelago. It's the $100 million that 62,000 other foreign tourists and I will spend this year in the Galápagos that allows these people to make a living. If tourists like me didn't come to the Galápagos, chances are most residents would move back to the mainland. This would make it easier for the creatures that belong here to survive. As it is, the human population is growing faster here than any place else in Ecuador  and the populations of many native plants and animals are plummeting. At this rate, the question is not whether or not the Galápagos will lose its uniqueness. It's a question of when. This all begs the question: Should we have even come here at all? Or, perhaps a better question is: Should I have ordered the ravioli?